Save the Date! - Registration Now Open! Registration for the 2019 SHAPE Montana Conference is now open!! Click here to go to our registration page where you can either register online or by mail. We look forward to seeing you July 29-30, 2019 at Helena High School in Helena, MT!! Stay tuned for updates on speakers and sessions! SHAPE Montana - Society of Health And Physical Educators (SHAPE MT) is a professional organization of educators dedicated to promoting healthy lifestyles among all Montanans through the promotion of health education, physical education, lifetime fitness and recreational activities, and dance. It is the duty of the officers and members of SHAPEMT to actively seek out new information regarding health enhancement and education in order to ensure professional development and to communicate this information with the people of Montana. 1. Increase advocacy efforts. Promote and communicate the benefits of a healthy lifestyle by providing professional development to members to pass onto stake holders. Promote sound professional practice to maintain/increase physical activity in K-12 education. **Annual convention, website, remain current with state and national legislation. 2. Increase available revenues. Increased available revenues enhances all aspects of SHAPE Montana to fulfill both the vision and mission. **increase sponsorship, increase membership. 3. Increase and diversify membership and services. Provide resources to promote and disseminate programs in health, physical education, recreation, dance, and sport. Expand recognition for programs from the alliances. **contact higher educational professionals, administrators, work on student membership, keep website updated, update awards, list serv. 4. Create a more efficient/responsive organizational structure and governance system. To help future leaders become better leaders. **leadership training. 5. Increase efficiency and effectiveness of member services through technology. Increase user-friendly access to information: promote professional development, health and fitness information, and sound professional practices. **list serv, on-line learning links to website. ​Brian originally served on the SHAPE board in 2009 as the Student Representative from Montana State University. After a year in that position, he was elected President-Elect and served out the Presidency the next three years. He is excited to be back on the board, helping with advocacy and working with the amazing people in our profession. Brian graduated from MSU with BS in Health Enhancement and Secondary Education in 2012, after teaching for two years at Sleeping Giant Middle School in Livingston, MT, Brian has returned to his alma mater and teaches Freshman Physical Education and Sophomore Health at Helena High School. He also coaches Basketball and Track for the Bengals, and serves as the coordinator for Soccer, Girls’ Basketball, Wrestling and Track. In his free time, Brian enjoys hiking, camping, and spending time with friends and family. Marti Edgmond has been the SHAPE Montana, Treasurer for the past 14 years. She is currently teaching K – 6 Health Enhancement at Boulder Elementary in Billings. Marti has a Bachelors Science in Health and Physical Education and her Master’s degree in Educational Leadership from Montana State University. She also enjoys officiating high school, NAIA and NCAA college volleyball. When Marti isn’t teaching or on the volleyball court, she loves to golf, garden and spend time with her family. Emily Raymond graduated from University of Portland with a M.A. in Teaching, from Portland State University with B.A degrees in Public Health Education and School Health Education, and from Linfield College with a B.A. degree in Sociology. She currently teaches at East Side School in Livingston, MT. Emily is the mother of 2, enjoys recreating outdoors, gardening, cooking, relaxing, and spending time with family and friends. Wendy is a graduate of UM with a BS in HPE. She also has her masters in educational technology. She currently lives in Missoula and is the 7th grade PE/Health teacher at Meadow Hill Middle School. 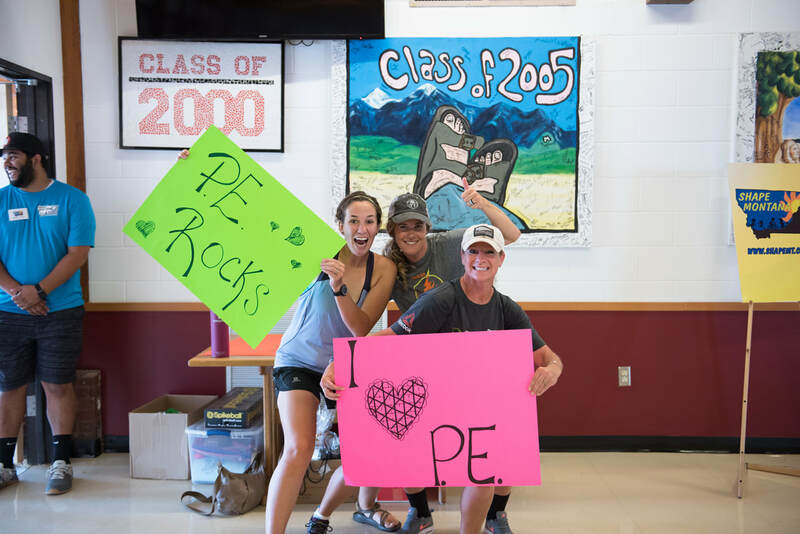 She has been teaching PE in Montana for 25 years. She helps coach 7th grade volleyball and is the Student Council advisor at her school. Wendy is married and has 3 children. She enjoys camping and spending time with family and close friends. Reg Hageman has taught Health and Physical Education at Capital High School in Helena, MT for the last 15 years. (21 total). Reg has been a tireless advocate for health and physical education in Montana and our nation, lobbying for high quality health/PE in Washington DC for 5 years. Reg was born and raised in Jordan, Montana and has 3 children in school, all who love PE and call it their favorite class. Besides serving as President, Reg is also the committee chair for Political Action and Advocacy​. Teri Wilkinson is currently the Secretary of the board a position I have held for the past 5 years. She is currently in her 30th year of teaching. She spent 3 years in Wolf Point as a Librarian before moving to Noxon 27 years ago, where she is currently the k-12 Phys Ed and Health teacher. She is also the Jr. High and High School volleyball Coach, Assistant Athletic Director, and Assistant Track Coach. Noxon has a volunteer ambulance service and at this time Teri is the President of the service as well as a volunteer EMT. In her spare time she loves to work out in the yard, read a good book, and spend time with her 2 grandchildren. Ashley has taught at Hyalite Elementary since 2011 after graduating from Montana State University. She has also spent the past two years as a Behavior Support Specialist as she finished her Masters in Educational Leadership in the spring of 2016. Ashley is passionate about providing opportunities for her students to experience the beautiful Gallatin Valley through activities such as hiking, skating, skiing, and many more that Montana has to offer. Ashley, her husband Josh, and two children stay busy enjoy hiking, traveling, and staying busy with everyday life. Nancy Stock has served on the MTAHPERD/SHAPE board for 11 years. She has been the Jump/Hoops Coordinator and President. Nancy has been the Executive Director of the board since 2009. A 1982 MSU Grad (GO CATS!) Nancy taught in Poplar and Corvallis before landing at Florence-Carlton Schools in 1993 where she teaches K-10 PE and Health. Nancy enjoys cross country skiing, gardening, and a good book! Ty is a classroom teacher in Great Falls. He is a member of the PE 150 group, promoting Health Enhancement and Physical Education in the classroom. Ty is married with 2 daughters. He coaches middle and high school basketball. Becky Eichelberger has been a board member for 2 years. She is from Red Lodge, Montana. Becky teaches K-8 P.E. and Health, coaches high school track, and junior high volleyball and track. Teresa Tolley is the Montana State University Student Representative. She is currently working towards her B.S. in Health Enhancement K-12. Teresa is on track to graduate from MSU in the fall of 2018. Teresa enjoys coaching her daughter's soccer team and also teaches in her church's children's ministry. Additionally, throughout her time at MSU, she has volunteered for the Little Bobcat Track program. Teresa lives in Belgrade with her husband and three children. She loves staying active with her family by participating in a variety of sports, hiking, rafting, and camping.